Ellipse uses short, safe bursts of intense pulsed light (called Selective Waveband Technology (SWT) by Ellipse, but often referred to as a Hybrid Laser System) to remove unwanted hair from all body sites in minutes. The results last for years. 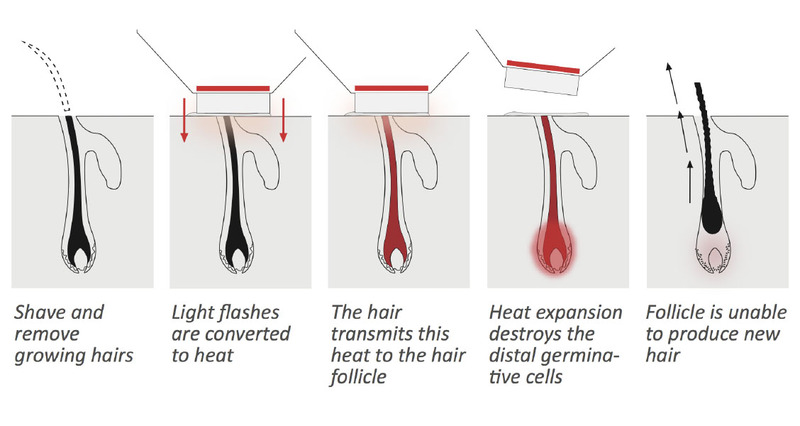 How does Ellipse Hair Removal Work? A thin layer of gel (similar to ultrasound gel) is applied to your skin before treatment, to ensure the maximum amount of light enters the skin. The Ellipse applicator is pressed against the skin and a carefully controlled pulse of visible light is released. Potentially harmful wavelengths and wavelengths that only heat up water in the skin are removed using patented Ellipse Dual Mode Filtering. The remaining light is absorbed by pigment (melanin) in your hair. Melanin converts the light into heat, which travels down the hair and heats the hair matrix, preventing future hair growth. A large number of hairs can be targeted in one flash of light. Treatment of the underarms or upper lip takes approximately 5 minutes, whereas a back or both legs take 20-30 minutes. While tolerance of pain is very individual, no anesthetics are required, and most people describe the sensation as practically painfree, similar to that of a rubber band snapping onto the skin. Every hair has a life cycle; it grows for a period of ti me, falls out, rests and then starts to grow again. Only hairs that are growing can be treated – so you need to repeat the treatment at intervals until all hair follicles have been treated while growing. The length and timing of the growth cycles are affected by numerous factors such as body site, hormone levels and age. Clinical studies have shown that typically 3-6 treatments are needed. Because the treatment relies on absorption of light by melanin, there needs to be melanin in the hair. This means that light blond, red, grey or white hairs do not respond, and the most efficient treatment is seen with dark hair. Ellipse is able to treat all colors of skin, and has pre-programmed settings for different hair thicknesses and skin colors to match your exact needs. It is important not to pluck, tweeze, wax or use hair removal creams during the four weeks before treatment. This ensures that as many hair follicles as possible contain a hair which can be destroyed. It is also important to avoid tanning (sun or self-tanning products) before and during the treatment period. Otherwise your tanned skin will absorb the light instead of your hair. It is also recommended to use sunscreen (min. SPF 30) for a four weeks following treatment.